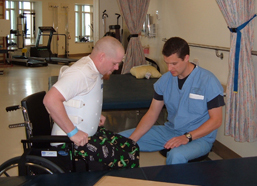 Presented on September 11, 2007, by Shelley Wiechman, PhD, assistant professor in the Department of Rehabilitation Medicine at the University of Washington. Dr. Wiechman discusses what hypnosis is, how it is used to treat pain, and what the research on hypnosis for treating pain shows so far. She reviews virtual reality and its use in improving hypnosis treatment and shows a video clip of a burn patient using virtual reality for pain management. Finally, Dr. Wiechman provides a demonstration of hypnosis induction and talks about how to find a therapist trained in hypnosis for chronic pain managment. Read the report or watch the video from this page. Presentation time: 61 minutes. After watching, please complete our two-minute survey! There are many myths and misconceptions about hypnosis. For some of you, your only experience or introduction to hypnosis may have been at the state fair, which is very different from hypnosis as it is used in a therapeutic setting. We don’t swing a watch back and forth in front of you. You won’t be asked to stand up and cluck like a chicken or do anything you don't want to do. That's not how hypnosis works when we're talking about hypnosis for pain control. Deep breathing and relaxation. A key component of hypnosis, relaxation helps to focus your attention and let go of defenses. Deepening. You tune out everything around you. Deepening is an altered state of consciousness that helps you relax, let go of defenses or inhibitions and really focus your attention on what the therapist is saying. This is where the crucial work of hypnosis takes place. Suggestions for change. The state of deep relaxation and focus of attention makes you more open to suggestions for change or new ideas. Again, the things the therapist is going to suggest to you are just that, suggestions. They aren’t demands, and they aren’t things that you don’t want to do. You are still in control. Alerting. During this time the therapist guides you to gradually bring your focus of attention back to the environment around you, open your eyes and become alert. Hypnosis is no longer seen as a fringe or alternative type of therapy; rather, the scientific community is studying and taking it seriously. Images of the brain can now show us that changes in activation areas in the brain occur when a person is under hypnosis. A lot of exciting new research is going on in this area, both for acute and chronic pain. Lang and others compared a group of patients receiving an out-patient surgical procedure using only standard sedation to a similar group using standard sedation plus hypnosis. (2) They found that the costs associated with this medical procedure were cut in half for the group that received hypnosis along with the standard sedation. This kind of research demonstrating cost savings may eventually lead to expanded coverage by insurance companies. Rarely does hypnosis completely take the place of standard sedation or medication. On the burn unit at Harborview Medical Center, we don’t usually replace standard narcotics with hypnosis, we supplement, and we’re finding that the need for the standard narcotics actually decreases if hypnosis is added. Patterson also reported on the successful use of hypnosis alone in place of opiates in a burn patient who could not use opiates because of an adverse reaction. (5) Luckily for this patient hypnosis worked very, very well, and he was able to go through his entire burn treatment with hypnosis only. Acute pain takes place before healing has occurred, whereas chronic pain sets in after the healing is already done: the injury has healed, but the pain remains, and it becomes chronic pain. Traditional biomedical treatments, like opiate medications, are generally effective for acute but not chronic pain. Chronic pain is extremely complex and difficult to treat. Psychological distress. There is a significant association between chronic pain and depression and anxiety. We have found that people don't get used to chronic pain. Instead, it actually gets worse; people get worn down after years of unrelenting chronic pain. Grieving the loss of activity. When chronic pain results in an inability to continue with usual life activities, grief over this loss can increase or maintain the pain. Original cause of pain is often gone. Deactivation. When you are having pain with any kind of movement, what do you do? You avoid movement, and as a result your muscles become deactivated and start to atrophy (shrink and become weaker). Thereafter, any movement you try to do is far more painful because the muscles haven't been used. This becomes a vicious cycle. Guarding. This is the tendency to tense up or tighten the muscles around the injured area as a way of protecting it, which then causes you to move or walk differently. For instance, if you sprain your ankle, the muscles around it tense up, causing additional pain. Furthermore, you will probably put more weight on the other foot, eventually causing pain in other parts of your body. In fact, a common problem following sprained ankle is hip pain on the side opposite the ankle sprain. Research on the use of hypnosis for chronic pain is fairly new. Some of the early studies actually found hypnosis to be ineffective, but we’ve since learned that these studies used the wrong types of post-hypnotic suggestions. We now know that in chronic pain situations the post-hypnotic suggestions need to focus on the five factors (from the list above) that are maintaining or aggravating the chronic pain syndrome. So, instead of suggesting to chronic pain patients that their pain will go away, which doesn’t work, the therapist might suggest that they're going to feel more energy and more motivated to participate in physical therapy or an exercise program. These suggestions are more successful in helping somebody who is coping with chronic pain. Many different kinds of chronic pain are associated with SCI. Musculoskeletal pain. 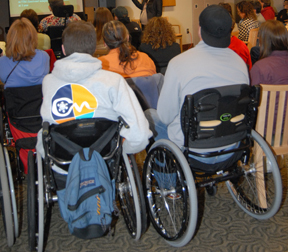 Pain that is associated with how you're carrying yourself, how you're sitting or using your wheelchair, e.g., shoulder pain. Neuropathic pain. Caused by abnormal signals from the damage to nerves that occurred in your injury. Allodynia. Pain caused by stimuli that normally do not produce pain. 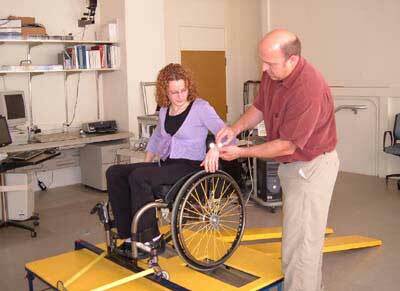 The vast majority of persons with spinal cord injury do report chronic, unpleasant sensations or pain. And about a third describe the chronic pain as severe, which is a very, very hard thing to live with. Chronic pain in persons with spinal cord injury tends to exist at multiple body sites and generally does not improve with time. It can interfere significantly with normal activities such as work and social life, and perhaps for that reason is associated with depression. Few medications are consistently helpful. Narcotics might provide some relief, but have potentially dangerous side effects. Many people can't function day to day on doses of narcotics required to manage the pain. We need more non-pharmacological interventions like hypnosis, relaxation, imagery, meditation and autogenic training for these pain syndromes. Medications aren't going to be the answer. A study here at the University of Washington found that hypnosis was effective in reducing chronic pain levels in SCI. (6) The 34 participants, who reported an average pain level of six (on a 10-point scale) at the beginning of the study, received 10 sessions of hypnosis with a therapist, as well as self-hypnosis training so they could continue the treatment at home. At the end of the 10 session, average pain levels dropped to five—not a huge drop but nonetheless important for people with chronic pain. Furthermore, this reduced level of pain was maintained three and six months later. Sleep also improved as a result of the hypnosis. Pain often interferes with sleep, and before the intervention participants reported their sleep disturbance at about six; after the session, this interference dropped to a four, improving sleep significantly. Again, this improvement continued when participants were assessed three and six months after completing the 10 sessions. Overall, this study found that hypnotic analgesia seems to be effective for roughly 23% of persons with SCI, is modestly effective for another 30%, and generally ineffective for 38%. It’s not helping third of the people, and we need to figure out why. This study also found that those who scored high on the hypnotizability scale had a better response. But even those who had mild to moderate hypnotizability scores showed improvement. These findings are very promising. Virtual reality technology, which enables a person to interact with a computer-simulated environment, has been used in a variety of training settings, such as medicine and the military, as well as in the gaming industry in places like Game Works. It typically involves donning a special helmet that enfolds the wearer in a virtual world of sight and sound and can be manipulated with manual controls, such as a joystick. In the UW Department of Rehabilitation Medicine, we have been working with the UW Human Interface Technology (HIT) Lab to use virtual reality to help induce hypnosis. One of the pioneers in virtual reality, the HIT lab was approached years ago by the military to help develop flight simulators for military pilots. We have a simulated emergency room where trainees can practice treating patients in an emergency situation, as well as simulated operations and surgical procedures. SnowWorld can also be used for virtual reality hypnosis (VRH) for chronic SCI pain. Wearing a special helmet, the patient is immersed in the SnowWorld program while undergoing the same steps of hypnotic induction as in regular hypnosis. As the patient floats (virtually) down the canyon, the therapist guides the patient verbally through progressively deeper stages of relaxation, ending in the deepest stage at a beautiful lake. At that point, the therapist gives post-hypnotic suggestions for comfort, relaxation, and pain management. At the end, the therapist guides the patient back up the canyon to alertness. The whole process takes about thirty minutes. It is important to work with someone who is qualified to use hypnosis in a therapeutic setting. I am not a hypnotist, and my colleagues are not hypnotists; we are clinical psychologists who use hypnosis as one technique for helping to manage pain. This is a crucial point. People who advertise themselves as hypnotists may or may not have any kind of behavioral or mental health training. But pain is such a complex issue that you really need to work with somebody who understands pain, who understands behavior management, depression, anxiety, and who use hypnosis as one of many techniques that can help manage pain. I think it’s important to find a psychologist, a social worker, a nurse, a counselor who has training in hypnosis and can use it in a broader context of a multi-disciplinary approach to pain management. Do not go to someone who advertises as a “hypnotist” where hypnosis is all they are trained to do. Look for a therapist who has training in hypnosis, but also is familiar with other types of therapeutic interventions. Shop around until you find someone with whom you have good rapport. If you don’t feel comfortable with someone, the hypnosis is unlikely to work. Patterson DR, Jensen MP. (2003). Hypnosis and clinical pain. Psychol Bull. 2003 Jul;129(4):495-52. Lang EV, Rosen MP.(2002). Cost analysis of adjunct hypnosis with sedation during outpatient interventional radiologic procedures. Radiology. 2002 Feb;222(2):375-82. Patterson DR, Everett JJ, Burns GL, Marvin JA. (1992). Hypnosis for the treatment of burn pain. J Consult Clin Psychol. Oct;60(5):713-7. Patterson, DR; Ptacek, JT (1997). Baseline pain as a moderator of hypnotic analgesia for burn injury treatment. J Consult Clin Psychol. Feb;65(1):60-7. Ohrbach R, Patterson DR, Carrougher G, Gibran N. Hypnosis after an adverse response to opioids in an ICU burn patient. Clin J Pain. 1998 Jun;14(2):167-75. Molton IR, Graham C, Stoelb BL, Jensen MP. (2007). Current psychological approaches to the management of chronic pain. Curr Opin Anaesthesiol. Oct;20(5):485-9. Hoffman HG, Doctor JN, Patterson DR, Carrougher GJ, Furness TA 3rd. (2000). Virtual reality as an adjunctive pain control during burn wound care in adolescent patients. Pain. 2000 Mar;85(1-2):305-9. Oneal BJ, Patterson DR, Soltani M, Teeley A, Jensen MP. Virtual reality hypnosis in the treatment of chronic neuropathic pain: A case report. International Journal of Clinical and Experimental Hypnosis. in press.